You'll love how Kate Aspen artisans have discretely and beautifully incorporated a bottle opener into the word Love. It truly is the perfect party favor wherever people are gathered in its name. 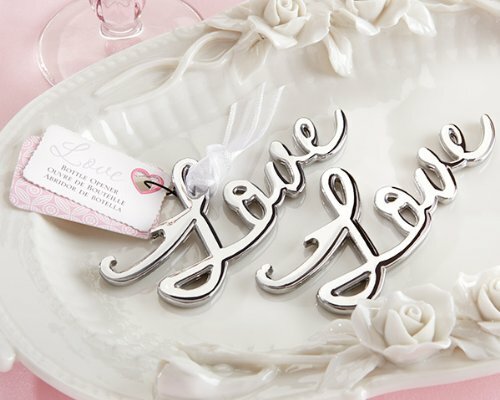 Features and facts: Romantic script spells the word Love in metal with a shining, chrome finish. Bottle opener measures 3 3/4" l x 1 1/2" w. Favor is double-tagged with die-cut heart and white-organza ribbon tie. Cluster sizes vary. If you have any questions about this product by FavorOnline, contact us by completing and submitting the form below. If you are looking for a specif part number, please include it with your message.